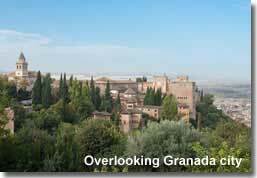 Holding a commanding position overlooking Granada city, the Alhambra sits on an enormous plateau surrounded by a fortified wall with numerous towers and turrets. Originally built for military purposes, it resembles many medieval strongholds of Andalucia in its arrangement, a fortress, a palace and a city, all in one, its layout, constructed over many centuries, is not of one grand design. The fortress, known as the Alcazaba, is the oldest part dating back as far as the 9th century when the Arabs where the rulers of Southern Spain, a status they held onto for several hundred years. The 13th century saw the beginning of the Arab Nasrid Dynasty, and the formation of the Alhambra to its present day set up. Arabic palaces were built for the Muslim rulers and princes, and the Alhambra became the residence of the Nasrid sultans, government officials, court servants and the royal guard. 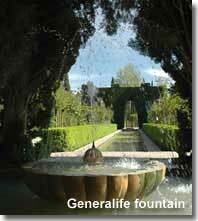 During this reign the Alhambra was transformed into an opulent and majestic city with impressive palaces and imaginative garden settings embellished with decorative fountains and terraces. 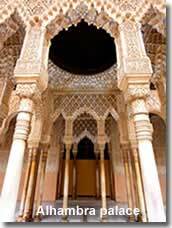 The architecture and ornamentation of the buildings illustrate classic examples of the Moorish characteristics typical of this period, influenced by this ancestry, today there are many buildings and homes throughout Andalucia that reflect this Mudejar style. The Generalife summer palace and country estate was also built during the period of Nasrid leadership and was used as a place of relaxation for the Muslim royalty. The Nasrid empire was the last Islamic reign of Al Andalus, at the end of the 15th century the city was conquered by the Christians giving rise to the reign of the new Catholic Monarchs, Ferdinand and Isobel. 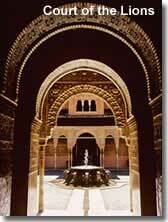 Under its new ownership further Christian buildings were added to the Alhambra and changes to the original Moorish architecture were made. 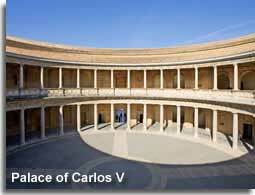 During the early 16th century the construction of a Roman style palace was started, the Palace of Carlos V, it was inserted into the Nasrid palatial area as a comparison of the strength and power of the new rulers and as a symbol of the triumph of Christianity over Islam. In the ninety or so years it took to build this palace it was never quite completed. In the centuries that followed, the Alhambra fell into a gradual deterioration until its renovation was actualised when it was rediscovered in the 19th century. 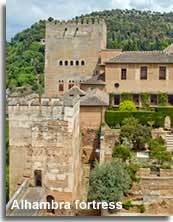 Today the Alhambra city consists of six palaces and two tower palaces, work on its restoration and conservation is an on going development. The Alhambra is a listed UNESCO world heritage site of outstanding cultural and historical importance and is now one of Spains major tourist attractions. 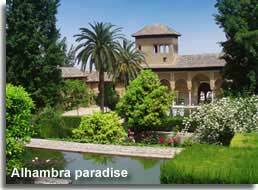 Further detailed information on the Alhambra is available from the Junta de Andalucia webiste alhambra-patronato and is available in English. Making arrangements to visit the Alambra can be a complicated affair, but it doesn't need to be, below I have provided information on the options available for both independent and guided visits including how to purchase tickets. If you plan to visit the Alhambra independently, rather than joining a guided tour, the following information offers advice and direction on the different types of passes available and details on how to book and obtain tickets for the Alhambra. Entry passes to the Alhambra are strictly limited to the exact type of ticket purchased, including the venue and the appointed time period of the daytime or evening, and are only valid for the indicated date. DAYTIME PASSES are either MORNING or AFTERNOON. 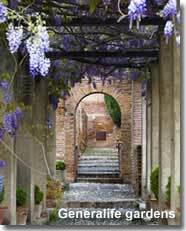 The general daytime pass, either morning or afternoon, allows access to all the public areas of the Alhambra. 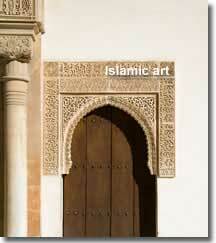 It differs from the Alcazaba and Generalife pass as it includes the Nasrid Palace* areas. * Access to the Nasrid Palaces is by a preselected fixed appointment, entry can only be made at this time, which is shown on the ticket, and is limited to thirty minutes. Due to the confinement of inside space within the palaces this restriction is implemented to ensure the maximum capacity of visitors is not overreached, allowing guests an optimum experience of the palace areas. This visit, either morning or afternoon, allows access to all the public areas of the Alhambra monument, including the gardens, but excludes the Nasrid Palaces & Palace of Carlos V.
There are two distinct night time itineraries, to experience both options they must be booked on separate evenings, as they cannot be combined within the same night. The Nocturna Palacios visit is an evening tour of the magnificent palatial area emphasised by special lighting arrangements. This visit is arranged by preselected time slots of thirty minutes in duration. The Nocturna Generalife visit is an after sunset tour through the gardens, accentuated by special lighting conditions, the itinerary starts in the Atrium of the Alhambra and includes the Paseo de los Cipreses and the Paseo de los Nogales before reaching the gardens of the Generalife and its palace. The Blue Circular pass entitles a visitor to combine the night visit to the illuminated Nasrid Palaces and the half day visit to Alcazaba and Generalife on two consecutive days. The most convenient method to obtain tickets for the Alhambra is via the online service offered by La Caixa bank, ServiCaixa Ticketmaster, reservations are in English along with further information on the itinerary, and ticket collection is made simple and easily available. The link to this service is provided after the price list and some noteworthy guidelines for ticket reservation and collection. Online prices are checked regularly for updates but Choose Almeria takes no responsibility for any price difference between those quoted above and the online price. Online booking commission (approx. 1.40€) is included in the price. The reservation of online tickets for the Alhambra through Ticketmaster is a straightforward process consisting of a series of steps to select the type of pass, the date, and if visiting the Nasrid Palaces, the time slot for that thirty minute visit. There are *discounts to some of the venues for the over 65s, under 15s, and the disabled, and free passes for the under 12s are also available on most of the visits, a ticket must still be selected for every member of the party which is discounted before making the online payment transaction and receiving the reservation details. A maximum of ten tickets per booking is allowed. Proof of age will be required on the day for discounted and free passes. In Step 3 of the booking process the discounted special offers can be applied where relevant, the discount categories are worded in Spanish on the website and have therefore been translated, below, to assist non Spanish speakers in receiving the correct offers for the chosen visit. Once booked and paid for the tickets can then be collect from *ServiCaixa terminals of La Caixa in advance of the visit or they can be printed from the collection terminals at the Alhambra itself. *ServiCaixa terminal locations are detailed on the Ticketmaster website by accessing the link ticket collection options on the itinerary page that follows the initial selection of the type of visit. It is important to note that collection of tickets by either of these two methods will require the same credit card used to make the purchase. 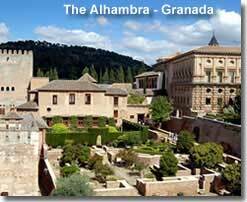 Early arrival for entrance to the Alhambra is wise due to the number of visitors. 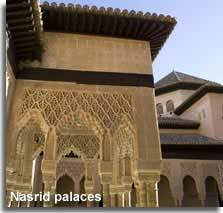 If visiting the Nasrid Palaces it is essential to allow sufficient time, at least an hour, to reach the palaces in time for the pre booked time slot. 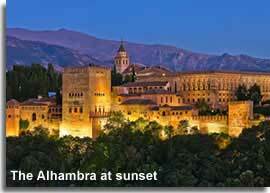 Book your Alhambra tickets online with ServiCaixa Ticketmaster in English. It is possible to buy a ticket on the day, from the ticket office at the Alhambra, however availability cannot be guaranteed. There are restrictions on the number of visitors per day and the demand for tickets is high, therefore advance booking is recommended. A guided tour of the Alhambra can be as part of a general group of people or arranged personally for individuals, families and smaller private groups. Entry to the Alhambra is generally guaranteed with a pre booked general group tour as tickets are usually included within the price. There are several different companies to be found online offering guided tours with English speaking guides. When booking it is important to pay particular attention to the tour itinerary, that it includes for example the Nasrid Palaces if that is a requirement, and of course to make sure that the guide is in the desired choice of language. 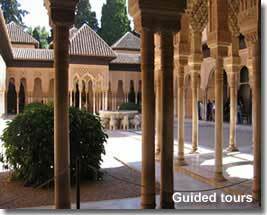 I have search the internet myself and found the following websites offering guided visits to the Alhambra, with the guide language available in English. The links provided below are to websites that, in my opinion, were helpful and easy to follow, though this is the extent of my knowledge of these companies. It can sometimes be a time consuming job seeking the exact information that you want so I hope that these links are helpful.